In our new screensaver you will see how Santa Claus is riding in a sleigh. Christmas is the most favorite holiday of the year! And the most favorite hero of Christmas is Santa Claus! Santa Claus is a kind Christmas character that gives gifts to children and adults. He lives at the North Pole. And now in our new screensaver you will see how Santa Claus is riding in a sleigh with deer to congratulate people on Christmas. The screensaver will give you a feeling of a holiday and will convey the atmosphere of Christmas. In addition, this screensaver has a festive musical bells accompaniment. Excellent animated graphics will come to life on your computer desktop. 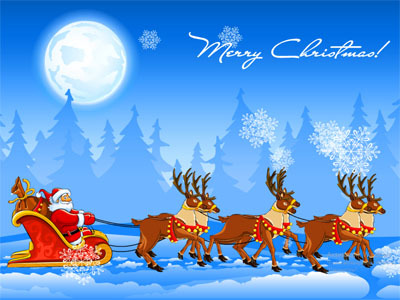 Download Christmas Sleigh screensaver for your desktop PC now. It is completely free and installs in seconds!